Midway point in Still Life Challenge. Get busy! 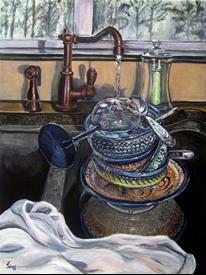 The Still Life Challenge With Glass Object hosted by Heather Sims has reached the midpoint. The guidelines are: this challenge is open to all media. Your still life should include at least one glass object. Entries should be done in 2009, there is a limit of 3 entries per person and the deadline is March 15th. There will be a small prize for the winner. This challenge can be found on the EBSQ Forum in Challenge Central and entries can be posted until midnight on March 15th in the Still Life With Glass Object Entries thread. So go, grab your brushes, your camera or your pencil and get busy!